There are a number of Weekly Markets in Queenstown. From fresh food and drink, to antiques, second hand goods and general souvenirs, it's a great way to spend a few lazy weekend hours. Queenstown Weekly Markets are designed with variety in mind. Foodies should head to the Med Market on Robins Road, for some gourmet Mediterranean-inspired goodies. It's open seven days a week, but often gets the freshest stuff in at the weekends. 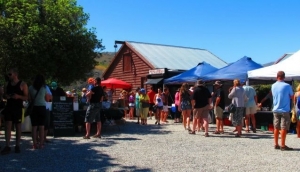 The Remarkables Market is held every summer Sunday at the Remarkables Red Barn, in Frankton, and has artisan foods, collectibles and antiques, as well as entertainment, and snack stalls. On Saturdays, head to the Creative Queenstown Arts & Crafts Market in Earnslaw Park, for some great locally-made sculptures, paintings, jewellery and textiles.